On Thursday evening, Wilfrid Laurier University students were given the opportunity to watch a live debate between the three presidential candidates running in this year’s Students’ Union elections. The debate was broadcasted by The Cord and took place at the university’s Waterloo campus. 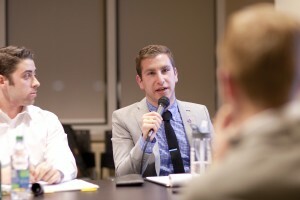 Over the course of an hour-and-a-half period, presidential hopefuls Sam Lambert, Chandler Jolliffe and Justin Tabakian engaged in discussions that were prompted by student-submitted questions. Not in attendance, however, was Andres Melendez. While many points were brought up over the night, a few stood out that spurred more intense discussions surrounding student issues. Mental health during Orientation Week was one such topic. All of the candidates believed in the importance of mental health awareness and education looking forward with next year’s Orientation Week. “It’s important that we give our icebreakers training on mental health issues,” said Jolliffe, addressing the need of engaging with incoming student concerns. Tabakian furthered the point that the Students’ Union needs to increase the communication of student body services available, such as the Wellness Centre. Another student question incited discussion around what each candidate would implement with regard to the student budget process following the beginning of their term. “Before the rest of my platform could be fulfilled and implemented, I would have to look at the financial standing and budget first to determine what action to take,” said Jolliffe. Lambert offered a different approach, suggesting that by “looking at historical data on how the budget has been handled in the past, it would then be possible to make adjustments from inefficacies made.” He stressed the need to take a fresh perspective on the process. Tabakian agreed with Lambert on the whole, emphasizing that money spent needs to reflect student needs. “We have to ensure that the way the budget is organized, and what the money is spent on, is adding value to the overall student experience. There has to be an urgency on making sure things are effective,” he said. Jolliffe challenged both of the other candidates’ platforms on the budget process, bringing forth the point that once in office the budget would start immediately and expressed his uncertainty about their actual plans. Lambert believed it wouldn’t take that long. “I plan to be in the office quite a bit if elected, so I feel like two weeks is more than enough time to organize and figure out the budget,” asserted Lambert. A big point that was brought up during the debate was the matter of how each candidate would ensure that the needs of Laurier’s Brantford campus are fulfilled. “I plan to ensure my presence on the Brantford campus is known at least once a week,” Tabakian said. Jolliffe pointed out that within his platform, he had nine points that dealt directly with the Brantford campus, assuring he had considered their concerns. Lambert also expressed his intention to spend time weekly on the Brantford campus to get to know the students and atmosphere of their campus. Jolliffe once again challenged his fellow candidates, pointing out that both of them had little concern towards Brantford in their platforms. Both Tabakian and Lambert refuted this, stating they had both visited Brantford earlier in the term. Tabakian added that he addressed in his platform. While Lambert suggested that Brantford should have been in his platform, he ‘”resented” the fact that Jolliffe stated he didn’t care about the Brantford student body. Following the debate, all of the candidates were happy with how discussions were held. “I thought it was great. All of the candidates did a good job communicating our ideas, questioning one another and finding out more about each other’s platform,” said Tabakian. “We had a great conversation. I think I defended my platform well and reiterated that I am proud of everything I’m doing and how I’m doing it,” said Lambert. Overall though, Jolliffe felt that the debates reflected each of the candidate’s platforms.